I’ve been trying to keep up with ASP.NET 5 and the various beta releases that have come out over the last months. It looks like we’re in for at least a couple more more beta releases (there are 8 planned and we’re currently on Beta 6 in mid-August). Of all the things that have been frustrating about ASP.NET 5, updating between versions has been the most painful for me. Every update - even after updating packages and runtimes has resulted in over 1500 errors between updates which when you first see it can be daunting. To be fair most of those errors are fixed by a fixing a couple of package dependencies but still it's quite a shock to open a project that just worked before updating to a new version and seeing thousands of errors :-). In this post I'll describe how I've been updating projects between betas. It's not been painless by any means, but following a few basic steps will make the experience a little easier. For context, I've been experimenting with ASP.NET 5 using a small sample project that I've been working on. I've been using this same sample for a variety of different implementations and platforms for a few years now. Those of you who read this blog have probably seen my Cordova AlbumViewer sample, or my MVC AlbumViewer sample that's part of the West Wind Toolkit. Using the same sample for a number of platforms makes it easy to compare features, lift related code and also compare performance which has been very useful in many ways. The app is also fairly mobile friendly and re-arranges itself a bit for phone and tablet operation. It’s a small API app with an Angular Client Side front end. 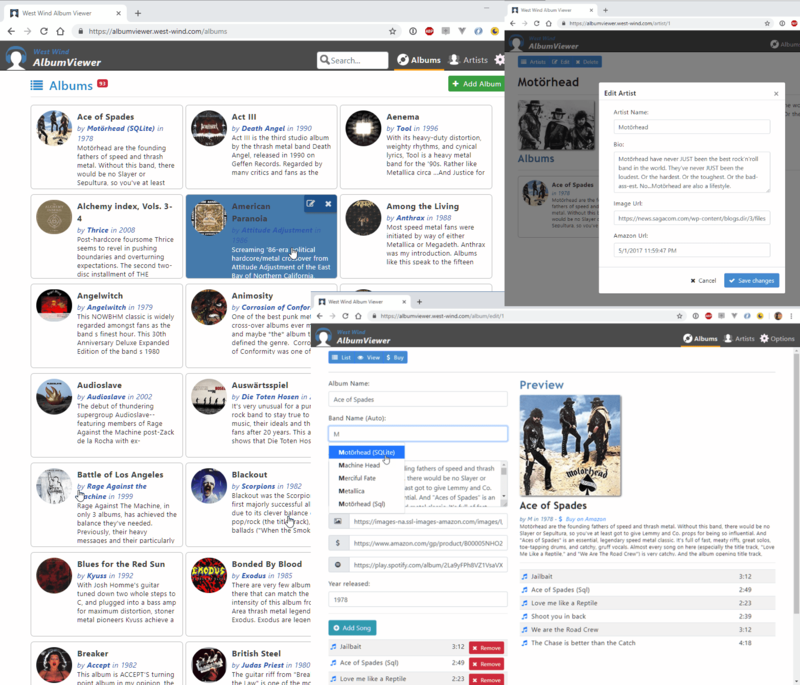 It’s set up with multiple projects which has made the migration process more complex as I have to update 3 separate projects first to get them to run then to make them coordinate and run together. 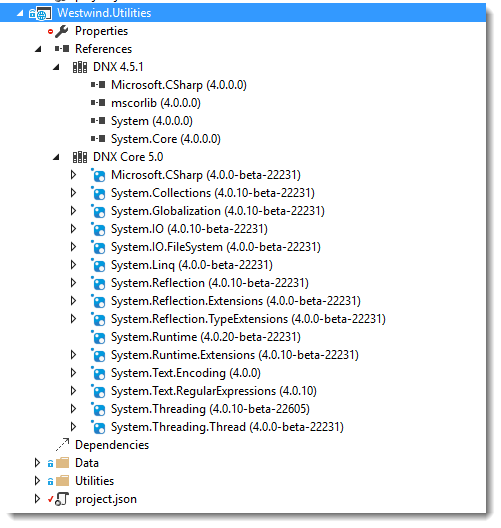 But I explicitly decided to do this to see what the update process and dependency management for multiple projects looks like which is a little different than the many simple ASP.NET 5 samples you find out there. A small subset of my utility library classes ported to .NET Core compatible operation. 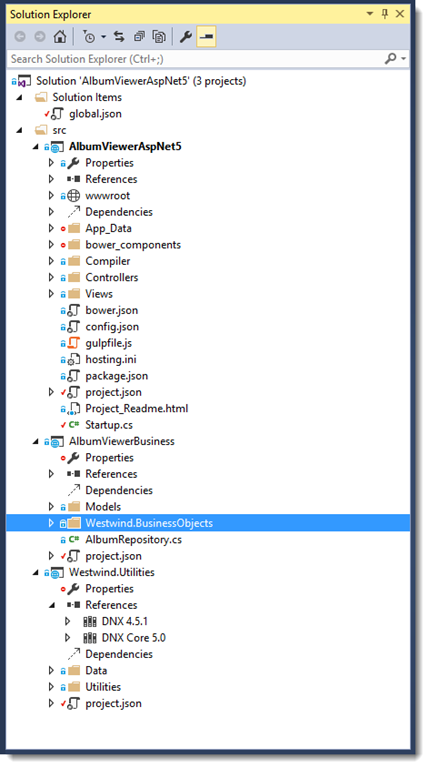 The business layer that contains the Entity Framework Models and Context as well as a Business object that wraps the classes. This project also contains the base business layer. Normally I would move that out into another separate utility project but given the troubles with updating projects I - for now - am keeping that code as part of the same business layer project. The actual Web front end project. Contains the ASP.NET and DI configuration and controllers for both the main API backend for the Web applications as well as a very limited MVC controller to display a few pages as server rendered HTML. These projects are pretty small but they represent what for me at least is a typical project layout. It would be a lot easier to maintain all of this in a single project, but my goal was to create support libraries and at least one toolset project (Westwind.Utilities) that simulates low level features that don't have high level dependencies that automatically pull in a raft of libraries. When you add something like EntityFramework or ASP.NET Hosting or MVC packages into your projects, you are automatically pulling in a ton of Nuget packages that satisfy most common dependencies (ironically in the same way that big libraries standard libraries in full .NET would do). But if you build a low level library that deals mostly with base component, you have to manually pull in all of your own low level .NET core dependencies that used to live in mscorlib.dll or system.dll. I seriously question that all of this micro-management of 'breaking out of packages' into tiny little dependencies will have any value in terms of footprint - especially since most applications will automatically reference a shitton of these things by way of their top level dependencies like ASP.NET or EntityFramework. Worse though I can see one bad apple pulling in lots of dependencies that aren't even used. All it takes is a lower level component referencing EntityFramework and you now pull in a hundred packages. I suppose this is the equivalent of referencign mscorlib, but it feels a lot worse when you look at a cluttered package folder of over a hundred NuGet packages. Curious to see how that works out in terms of actual memory/footprint savings in the end. I've been sticking to the major Beta releases and the main NuGet feed that provides the package references. For the really bleeding edge you can switch to the dev feed, but I've found that to be too intense to keep package relationships intact. Unless you are working on the ASP.NET source code itself, stick to the major beta releases. Even using these steps the updates – for this small project – tend to take easily a couple of hours of hunt and peck debugging and troubleshooting. To be fair this troubleshooting in many ways has helped me understand how things work behind the scenes but it is disconcerting to see how much is changing between these ‘beta’ releases. The first step you need to do if you’re using Visual Studio when a new beta rolls around is update your Visual Studio tooling (thank to Damien Edwards for reminding me). The tooling is synced with the latest DNX changes and is required to make sure your projects use the proper command line options etc when compiling code. Since those tools are still changing that's one requirement. The other is that there are some dependencies on the core libraries in the tooling and since those core libraries are also still changing the updated tooling is required. The tricky part about this is that it's easy to forget. I didn't do it on my Beta 6 update and had a number of weird compiler errors that didn't make sense (even after updating references in the next step). Installing the new tools fixed a number of bogus compiler errors. to update the actual dotnet version manager binaries. The announcements page shows breaking changes and a few other useful things that you probably will have to address in your code. It's by no means complete and not easy to see how it relates to existing code sometimes but it's a good place to start. Check this first then update your references and make code changes accordingly. For me this has been the most troublesome part of the update process. When I opened my small AlbumViewer project after updating references and runtimes I end up with over 1900 errors in my projects! Yikes. For example here's what my compile output looked like. When looking at the error list it's easy to see that most of the errors are related to base types that are not referenced properly which is most of the time caused by bad references. So the first step is to update all references to the latest versions. If you're using multiple projects like I am, compile one project at a time. Start with the one that has the least dependencies and then work outwards from that. In my case I fixed Utilities first, then the Business project, and finally the Web project. All of these have the Beta6 postfix so in order to update them I could simply rename them by doing a search and replace on beta5 to beta6. That part is pretty straight forward and as it turns out most of those assemblies are staying the same. and then drop of the actual build number. The 'safe' NuGet feed should have the latest version in there for the current Beta. If you're doing any custom configuration in the overridden OnConfiguring() you'll get a DbContextBuilder passed and that needs to be updated. Suprisingly there were no changes required for any other code in this beta 6 update for which I am thankful. Troubleshooting start up issues due to renamed or moved components can be a royal pain, especially if said components and dependency injected. The errors emanating from injected components tend to be less than conducive to finding the real problem. The Beta5 to Beta6 so far was probably the smoothest upgrade for me. I only had to make a few changes related to Entity Framework - no code changes to anything else. However, beta3-4 and 4-5 were drastic with lots of changes. The only way I could get things to work was by creating a new project and then comparing the start up code and basic config code to my own project. For startup code a new project probably works fine, for other things like Entity Framework Configuration and and Controller operations I recommend looking at the MVC MusicStore sample. For me this has been the best place to see working code for each beta cycle as there's good effort to keep these sample apps up to date. I've been using the SPA sample since that's the closest match to what I'm doing in my sample. Thanks Rick. Super helpful stuff.